Did you know that 40% of garbage sent to Vancouver's landfill is organic waste? * Another fun but sad fact: when buried in a landfill, your food scraps or gardening clippings DO NOT just break down into soil because the organisms that do that need oxygen to survive. Instead, an anaerobic reaction takes place, which, instead of making compost--a great fertilizer--it makes carbon dioxide & worse, methane, a flammable greenhouse gas. Composting is a great way to reduce the amount of stuff your household sends to the landfill & thus your environmental footprint. But--big but--if you don't have a yard, how can you compost? If you've got a balcony, you can get a small, self-contained worm composting system. The city has a great program where you can get a subsidized setup for just $25 & including a 'wormshop' to learn how to do it. If you're interested, visit the City of Vancouver worm composting bin page for more information. Okay, that's great, but maybe you don't have a balcony or can't imagine taking care of worms? You can still compost! Starting this June, you can drop off food scraps at the Mount Pleasant Farmers Market, as well as other locations around the city. 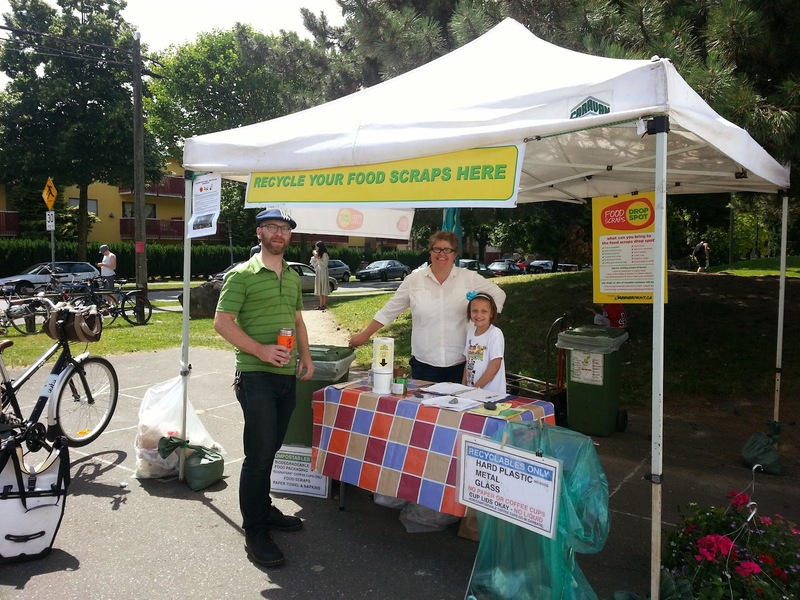 Food Scraps Drop Spot is a not-for-profit community based food scrap diversion program, created to help apartment & condo residents divert their food scraps in Vancouver, BC. To collect your compost, you don't need anything fancy, though the shiny steel buckets Lee Valley sells for this purpose are sure pretty. 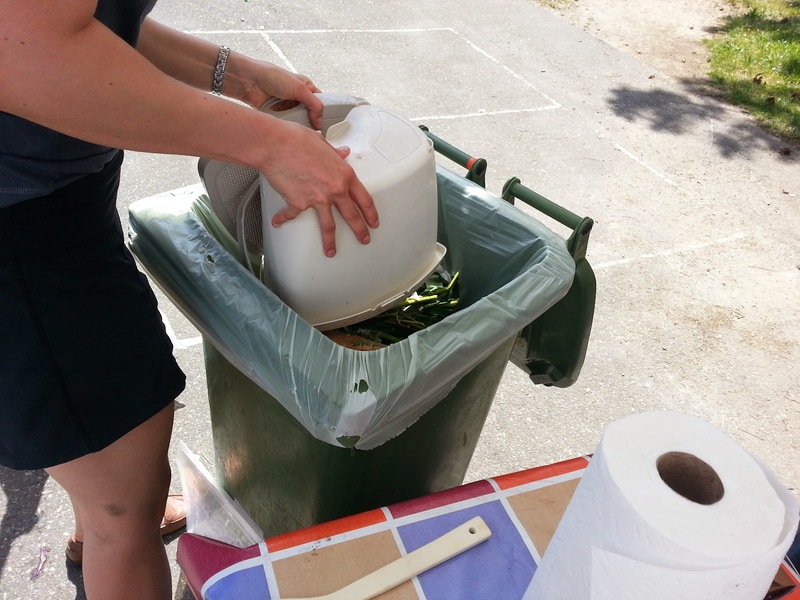 A 4L ice cream bucket or two is sufficient to hold your veggie peels, plate scrapings & so on. (Yes, I'm giving you an excuse to eat 4-8L of ice cream: it's for the good of the environment!) If you're worried about how those food scraps will smell by day six in your kitchen, here's a tip: pop it in the freezer when you're not loading apple cores or leftovers into it. No smell, no fruit flies & it's out of sight. You can also use newspaper or paper bags to line the container & make disposal even easier. Dropping off at the Food Scraps Drop Spot is free, though donations are always appreciated & if you'd like to help out, volunteer on the Drop Spot Squad, with outreach, or data entry. *I'm hopeful that the amount diverted from landfills is a bit higher now, the 40% stat is from 2011, the most recent I could find.